This year I have the opportunity to demo again in the IBM Connect 2014 Keynote (aka. OGS , aka Opening General Session). I'll have the opportunity to show the latest for IBM Connections, meetings, mail, and more. If you are already here, I'll see you in 2 hours. If you are not here, then you can watch the live stream here. It starts at 8am ET (GMT-5). After the keynote, I'll be doing the What's New In IBM Connections in 2014 at 1pm and at 3:45pm where I'll go into more details on the roadmap of IBM's social collaboration platform. The countdown to IBM Connect 2014 is almost over -- just 3 more days! I'm at the airport now just about to board my plane to Orlando. Before I do, I wanted to share the latest announcement from ISW: Kudos Boards. Kudos Boards provide a brand new experience to interact with IBM Connections Activities. If you are an active user of Activities you'll definitely want to check this out as it gives you another way to manage and organize your projects. The new experience makes it easier to manage very large and complicated projects. With Kudos Boards you also get a new view of To-do's to give you a better sense of what's critical for you to focus on right now. You can also create your own custom lists of items to work on giving you the power to personalize the experience for you helping you see the right information at the right time. This is a great example of using IBM Connections as a social layer as Kudos Boards is built entirely on top of the API's so everything is available through the mobile interface and other plug-ins available and each user picks the experience they want to leverage. ISW is going to be at IBM Connect 2014, so definitely stop by their booth to learn more. As we continue the countdown towards IBM Connect 2014 (if you are counting, we are now 5 days away!) , I wanted to share the latest plug-in for IBM Connections. This one would be extremely valuable for worldwide organizations. Today, IBM Connections is translated into 25 languages. This removes the barrier to collaboration as the interface is automatically translated into my preferred language. That's great that I can access the interface in Spanish, for example, but what happens when one of my colleagues posts a status update in German? Reverso can solve that problem with their new plug-in for IBM Connections. The plug-in can translate user created content into the language of my choice. Today, Reverso claims to have more than 200 customers with over 3 million users taking advantage of their translation services daily. Reverso Translate for IBM Connections from Reverso on Vimeo. To learn more, check out Reverso's corporate product page. IBM Connect is almost here which means... roadmaps! We are now 6 days away from IBM Connect 2014 which means it's time for roadmaps ! Simon Vaughan is one of the IBM Champions and one of the leaders of the IBM Connections Users community, where all IBM Connections feature requests go. 108 total ideas have been graduated and are now in the Connections product! 68 ideas where added into the product in 2013 in 2013 alone! 9574 total votes from 1661 members of the community (an increase of 499 users year over year). I'm very happy with the results. The customer base for IBM Connections is truly engaged and giving us some great feedback! And we are executing on those as fast as we can. In fact, next week at IBM Connect 2014, I'll be talking about the roadmap for IBM Connections. You will see that many of the ideas will be incorporated. And this means that if you want to see your ideas in the product, you have to vote for them (and submit your idea if they are not there yet) ! This is it! IBM Connect 2014 is now 10 days away and the news just keep coming in. If you haven't registered yet, what are you waiting for? Do it now! Are you a mobile user that always needs access to your files ? Perhaps you are already using apps such as Goodreader, Notability, Pages, etc and now you want to interact with IBM Connections files directly from those apps? File Jockey is your answer. This new integration adds some "magic" to IBM Connections (don't' worry, I'll spare you the details) so you can seamlessly interact with your files from your favorite mobile and desktop app. For example, on the Mac, you can use ForkLift to get to your files directly from Finder. On your iPad, you can use Goodreader to annotate PDF files, take meeting minutes, and manage your files. The trick is finding any app that supports something called WebDAV. If your favorite app supports WebDAV, then this is the solution for you. Another approach is to look for apps that support CMIS since that's the native protocol Connections supports as I discussed on this post from 2011. To learn more, check out their website and you can start using it today against one of our demo systems. IBM Connect 2014 is now 11 days away and the announcements keep pouring in! Today, I wanted to share a demo video from Synthesio, a social media monitoring and analytics company. In their blog last week, Synthesio announced their integration with IBM Connections, IBM's social collaboration platform. have access to actionable social media data in real-time and the power to act on it. can leverage social media data directly from their existing Connections workflow. can save time by giving influencers the attention they deserve in real-time – without memorizing another login, without learning any new software, and without interrupting their workflow. All within the IBM Connections platform. If you haven't registered yet, go ahead and register today for IBM Connect 2014. See you there! With IBM Connect 2014 less than 3 weeks away, we are getting to the time where we start seeing many announcements coming out from IBM and its partners. Today, I wanted to share the announcement that OpenQ made a few days ago. OpenQ now offers SafeGuard for IBM Connections, IBM's enterprise social network. The solution can analyze content, and archive/quarantine alongside with content coming from other social networks like Facebook, Twitter, LinkedIn, etc. If compliance and risk management was holding you back, there are no excuses anymore! To learn more, visit OpenQ at their booth at IBM Connect 2014. 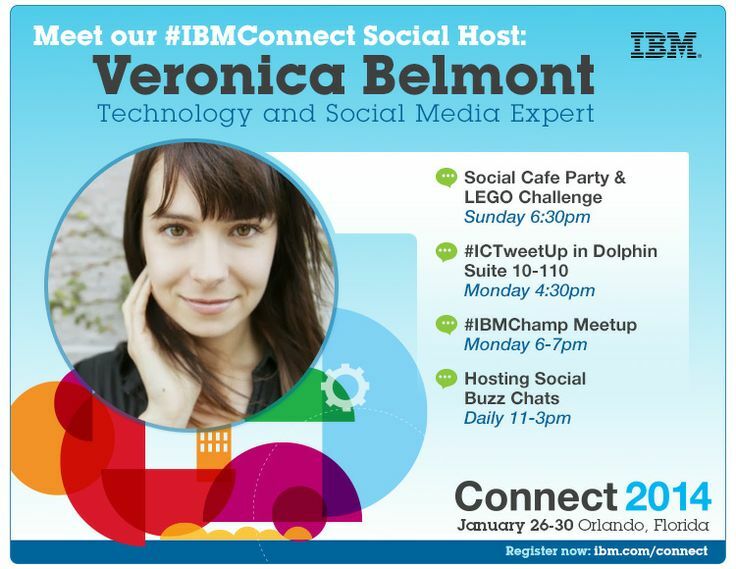 We are just 3 weeks away from IBM Connect 2014. I've created a page here on my blog with some conference details that you may want to follow. Just like last year, this year I'll have the opportunity to share the roadmap for IBM Connections, IBM's social business platform. At the conference, I'll also be joining my colleagues Luis Suarez andLouis Richardson where the agenda is set by YOU. Our goal is to discuss 12-14 topics for 3 minutes each (1 minute for each one of us). To submit topics/ideas for us to discuss, tweet them using the #PTIsocialbiz hashtag. We'll be monitoring this tag up to Monday of the week of the #IBMConnect conference! Last year was the first time that we did this session, and the feedback was overwhelmingly positive. Therefore, I can't wait for this year's round! Bring it on!!! See you on Tuesday the 28th! Here's more details about our session.